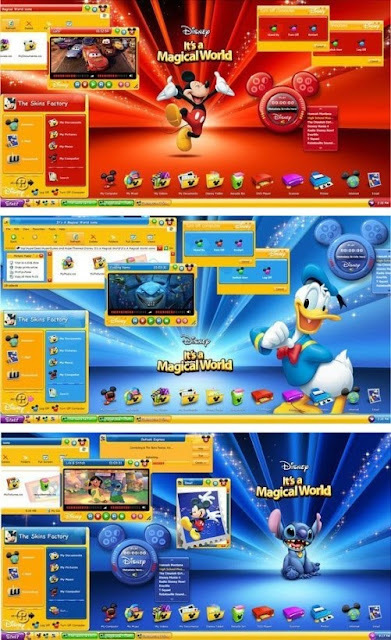 Disney’s It’s a Magical World™ Now you and your entire family can celebrate the magical world of Disney, with these 7 in 1 enchanting Windows XP desktop themes. 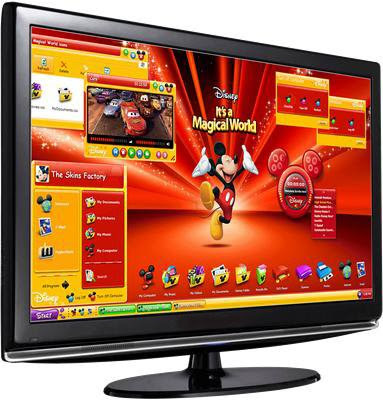 Bring your favorite Disney characters into your house and onto your Windows XP desktop. The Skins Factory’s artistic graphic wizards have created the world’s first official Disney Desktop for Windows. Included with the themes is all the software you need to apply the 7 multi-colored hyperthemes, 29 icons, wallpapers & Windows Media Player video skin. The Mickey Mouse Yahoo! audio widget remote for iTunes & Windows Media Player 11 is also included, but you will need to download the free application, Yahoo! Widgets to use the audio remote.